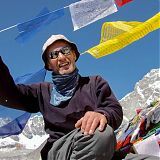 Professional photographer/mountaineer and regular WPH guide Stuart Holmes will be returning to Everest April 2019 with an intrepid group of WPH guests for our Everest Base Camp Photographic Expedition. 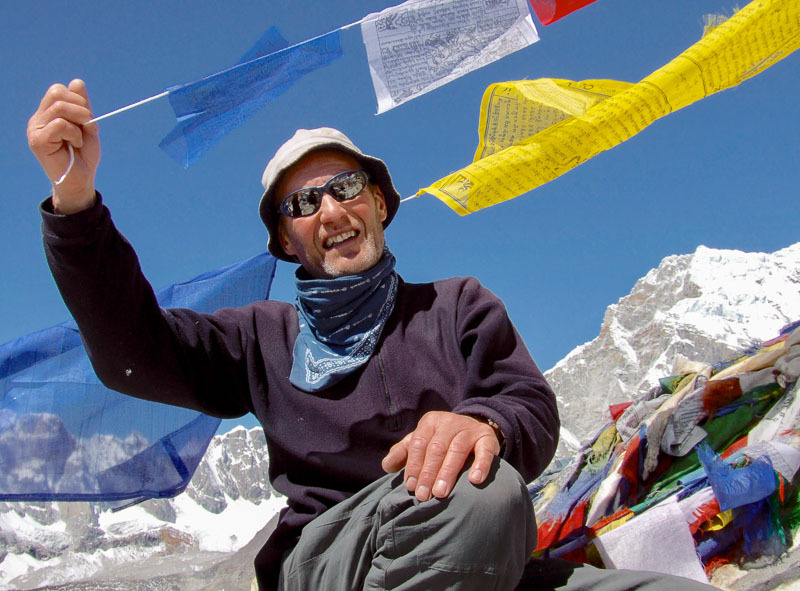 Stu summited Everest in 2005, although this time his focus will be set firmly on guiding our guests through some stunning Himalayan scenery on our photographic journey to Everest Base Camp. En-route he will encourage and mentor guests in their quest to take home some fine images from this remarkable and dramatic area. 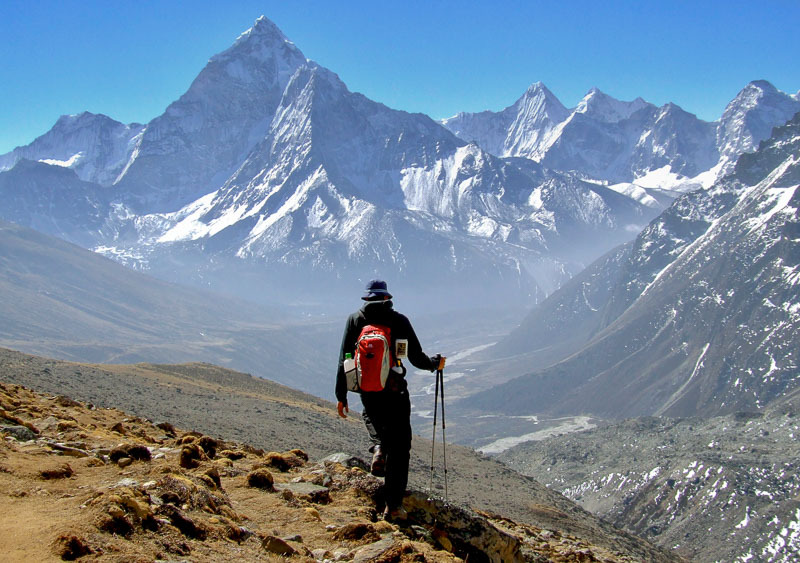 Everest Base Camp is a classic trek with magnificent close up views of the world highest peaks including Everest. From the moment you step out from the small plane onto the unimposing airstrip at Lukla, the sense of excitement and anticipation in the air is palpable. 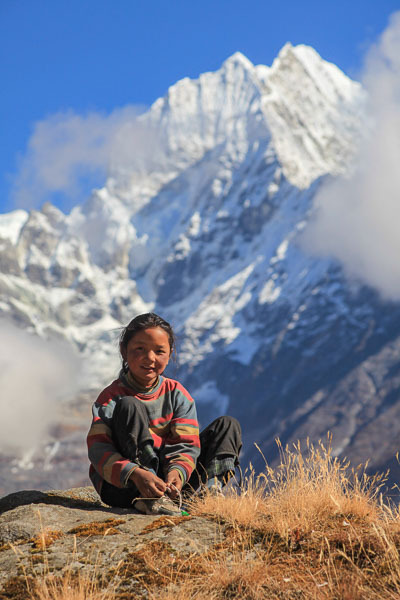 We first walk up to the Sherpa capital of Namche Bazaar, its market stalls, dramatic ridge walks and breath-taking views make it an ideal spot to rest and acclimatise, ready for the challenging days ahead. 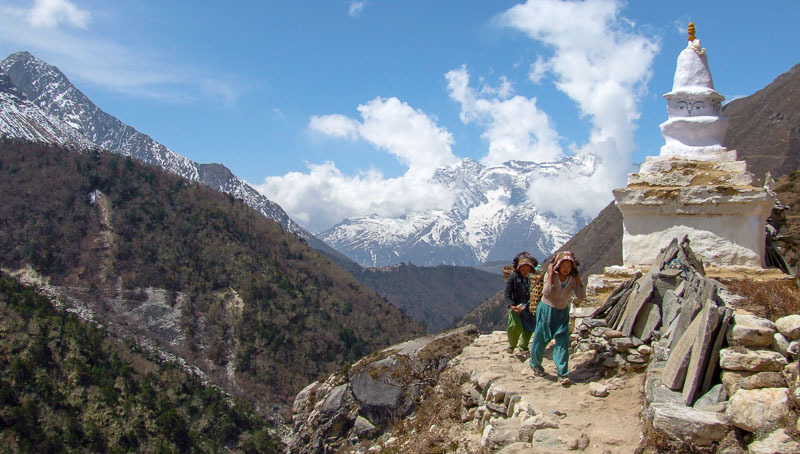 Beyond Namche, the trail traverses ever steeper hillsides, and the walking becomes increasingly exhilarating. 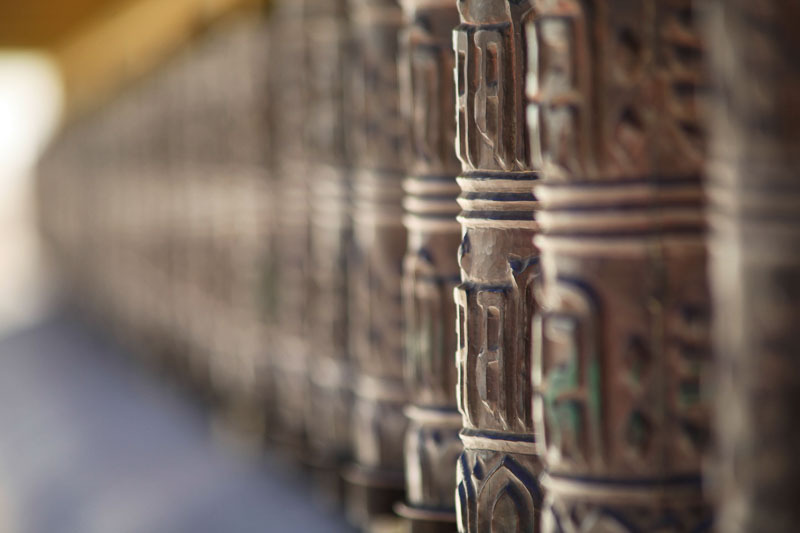 We stay in remote lodges along the way and visit hauntingly beautiful Buddhist monasteries. When we finally leave the villages and terraced fields behind, the trail remains steady although the ruggedness of our route along with the increasing altitude begins to be felt. 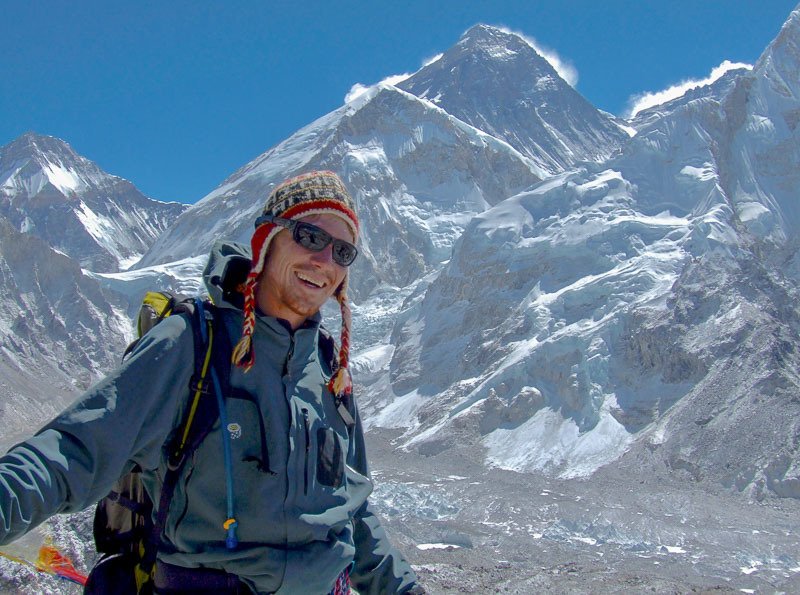 Don’t worry though, Stu and your Sherpa team will look after you well, you’ll make it! 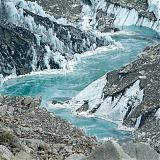 Our ultimate destinations are Everest Base Camp (5300m) and Kala Pattar (5554m) the famous vantage point with magnificent close up views of the Khumbu icefall and the SW face of Everest. Both are awe-inspiring places to stand, contemplate, take photographs and simply marvel at some unrivalled world class vistas. You can be sure that you will be joining a group of like minded people who love to take photographs, want to learn new skills and have fun whilst journeying together through a unique mountain environment. 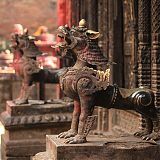 Arrive in Kathmandu and transfer to our three star hotel. Our first meeting together as a group will be in the evening for introductions, a trip briefing, and an image presentation followed by dinner. Quite often flights leaving Europe will arrive in Kathmandu a day later via Delhi. 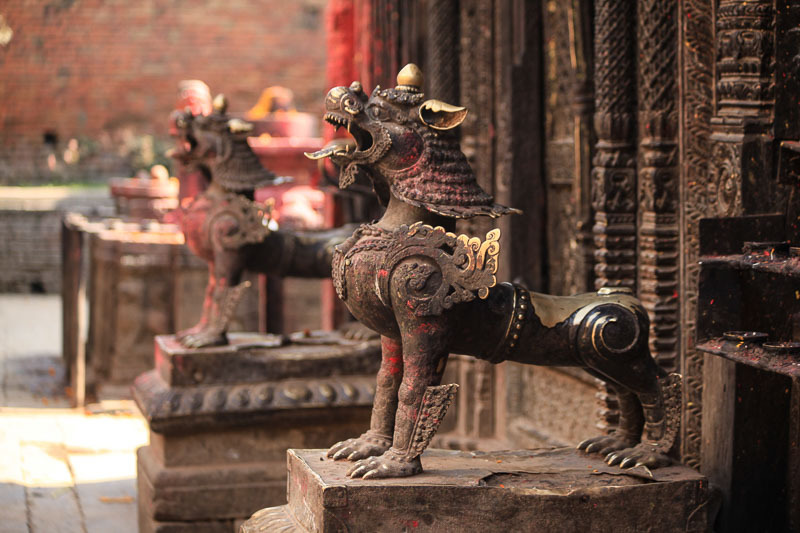 Patan Durbar Square: Patan, the oldest of all the three cities of Kathmandu valley. 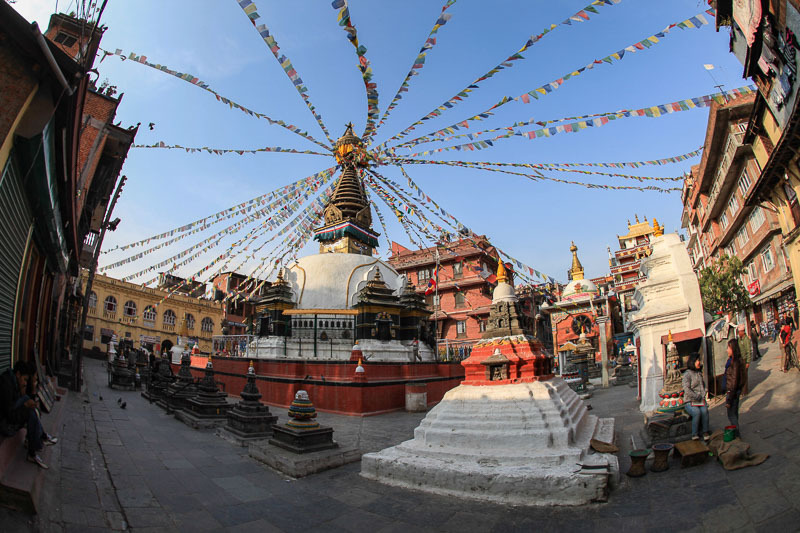 Durbar Square is best known for its artistic heritage and is full of ancient places, temples and shrines noted for their exquisite carvings and is probably one of the oldest Buddhist Cities in the world. 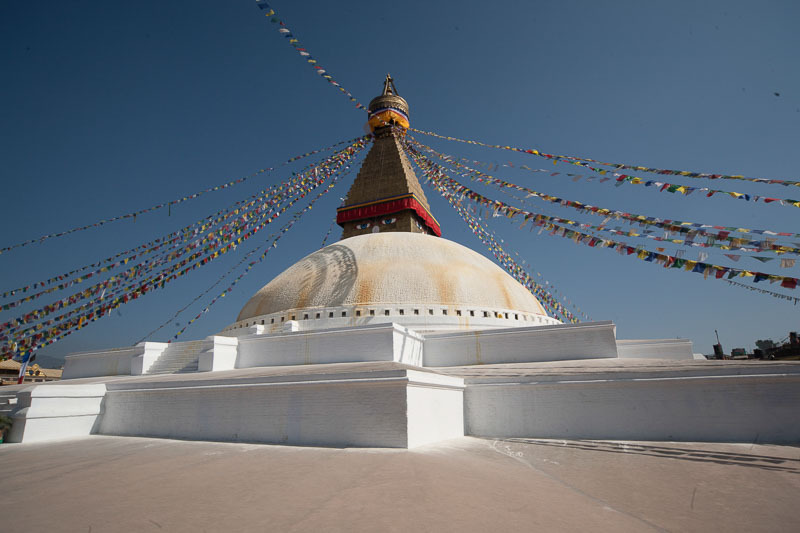 Boudhanath: This is the largest dome shaped Stupa in Asia where the sacred Buddhist prayer “Om Mani Padme hum” soothes the soul from dawn to dusk. 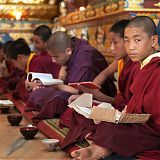 We will mingle with maroon robed monks circumnavigating Boudhanath whilst the character-full elderly citizens of Tibetan origin gather to socialize with each other. 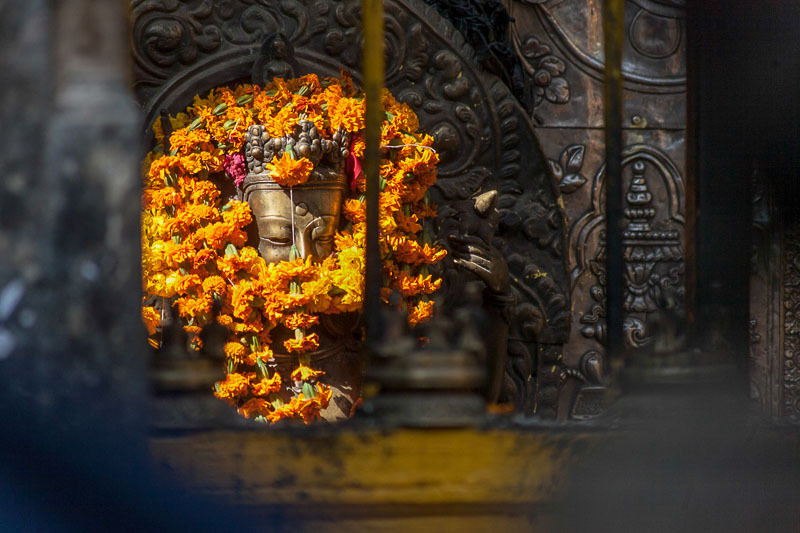 Swayambhunath: The watchful eyes of Gautama Buddha look out over Kathmandu from atop this ancient Buddhist Stupa. 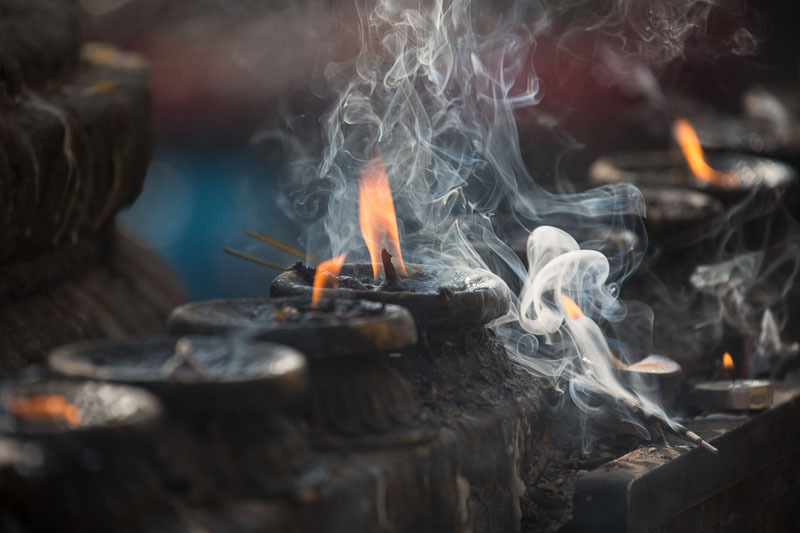 The aroma of incense and butter lamps dominate the entire atmosphere whilst devotees circumambulate the stupa spinning their prayer wheels. 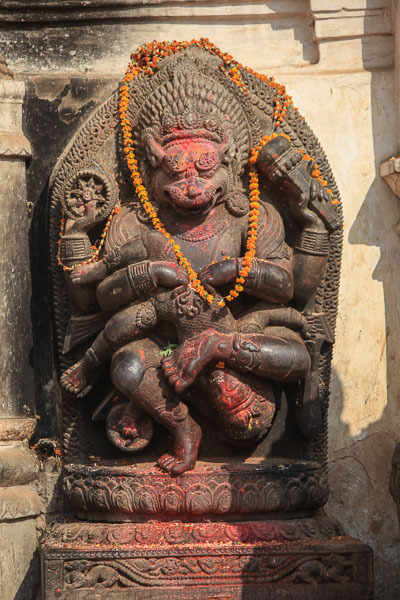 A host of monkeys throughout the vicinity justify its name, the Monkey Temple. 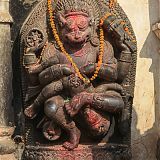 Pashupatinath: Here we encounter Nepal’s largest and holiest Hindu shrine lying on the banks of the Bagmati River. 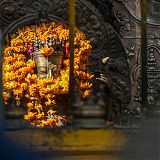 We will pass through a long array of small temples and sacred Shiva Lingams surrounding the golden hooded main temple. 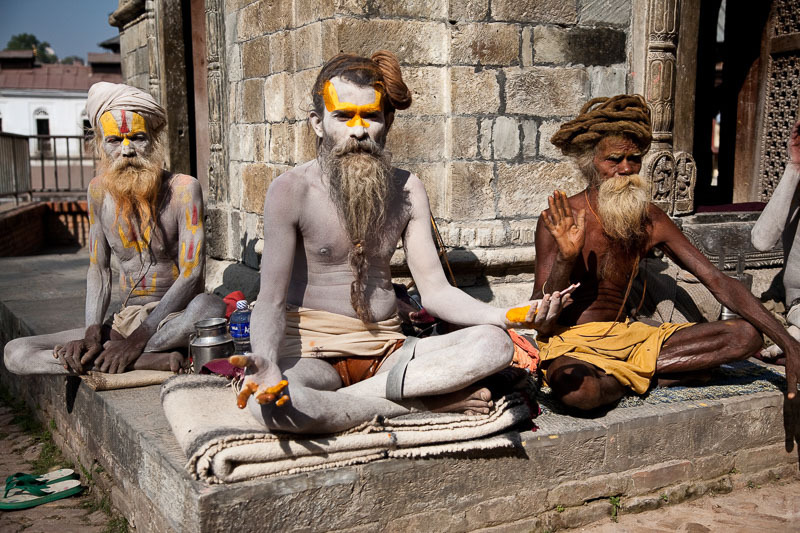 Colourful ash-smeared Sadhus are ever present around the cremation Ghats of Aryaghat. 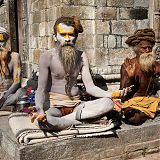 Located on the river bank these holy men epitomise the spiritual immersion of life, death and re-incarnation which is such an integral part of Hindu life and spiritual beliefs. 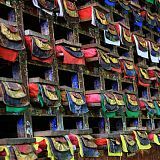 Old Asan Bazaar: This bustling colourful market can be found in Kathmandu’s oldest settlement and will give us some fabulous opportunities for street photography including interesting tradesmen and culturally attired local people. 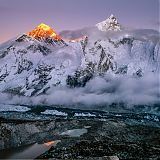 In the evening we will have a final briefing before packing & preparing for the start of our Everest Base Camp Photographic Expedition. 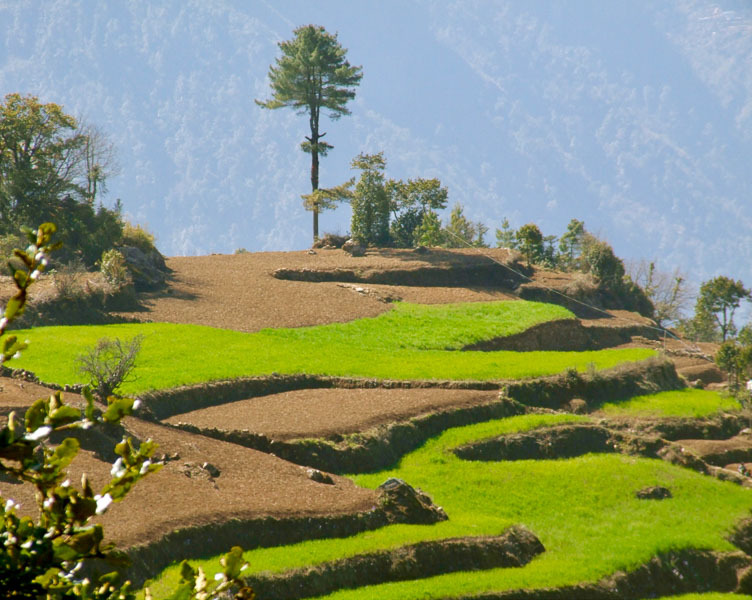 Leaving the hustle and bustle of Kathmandu behind we take an exciting flight over the Himalaya to Lukla where there is a small unimposing airport and a variety of shops and lodges. 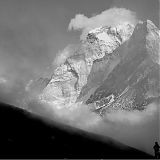 Here we will meet our porters and local guide who will be with us for the whole expedition. Once all our loads are sorted we set off through the cobbled streets of the town. Today is mainly a downhill trek through lovely forests, little villages and past sacred mani stone walls to the village of Phakding. 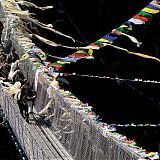 To get to our lodge we cross a spectacular prayer flag be-decked suspension bridge spanning the River Dudh Kosi. We spend our first night here. We get up early as the light first thing is usually very lovely for photography. 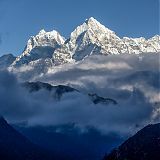 Following a hearty breakfast we leave for a trek to the main trading centre and hub for the Khumbu region, Namche Bazaar. We check into the Sagarmatha National Park entrance check point just above the beautiful village of Monjo before climbing steadily uphill. We ascend a winding path on the banks of the Dudh Kosi River, through villages dwarfed by gigantic rock walls until a final climb through the forest that brings us into Namche. If we are sensible en route we will take several stops to photograph, rest and enjoy all that this lovely day has to offer. We have chosen to trek at this time of year as the Rhododendrons will be in flower and the surroundings in these lower areas will be lush and green. Namche Bazaar is in a unique position surrounded by fabulous snow capped mountains with colourful houses scattered in an amphitheatre of rock terraces. This morning we will take a well deserved rest to explore the rich photographic locations of this bustling Sherpa settlement. 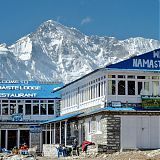 After lunch we will venture uphill to Khumjung Village and the Everest View Hotel (3962m). 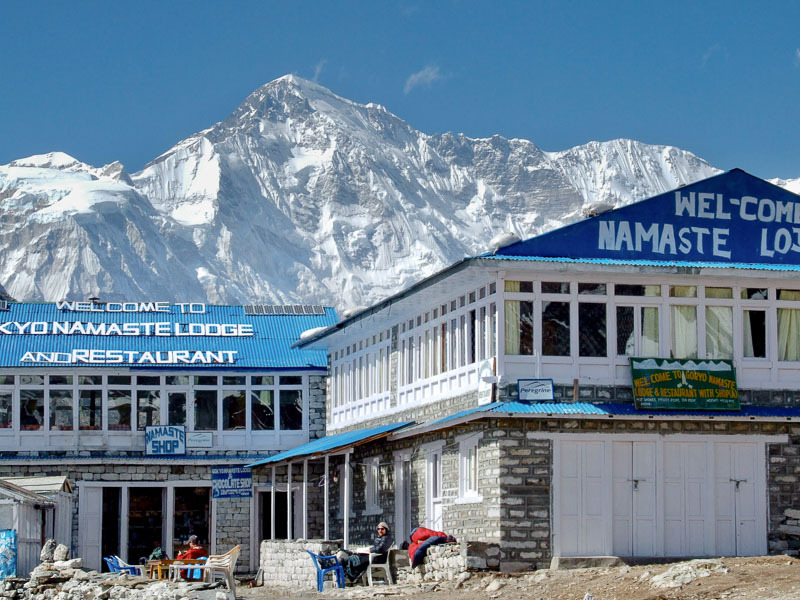 We may stop for a well deserved rest and refreshing drink to enjoy some fabulous views of the mountains Everest, Lhotse, Lhotse Shar, Taboche Peak and Ama Dablam. 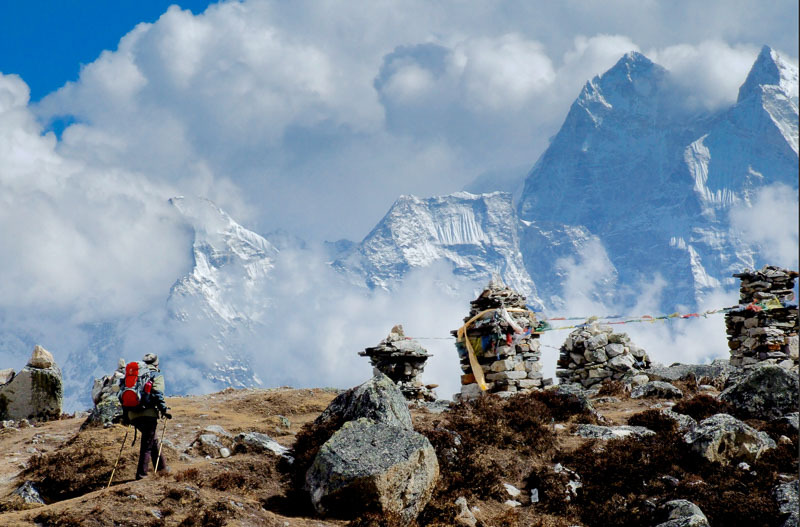 On our way back we will visit the villages of Kunde and Khumjung set below Khumbila a rocky peak that is sacred to all Sherpas. Local people will be busy farming in fields divided by ancient stone walls. In Kunde itself we will pass the Edmund Hillary School and pay a visit to the hospital which Hillary built in the sixties. Both are still going strong funded by the Canadian based trust that he founded. Our view down to Namche from here is both graphic in it’s simplicity and breathtaking. Back at our lodge we will hopefully find time to look through the images we have taken so far, and to consider some creative photographic ideas for the days to come. 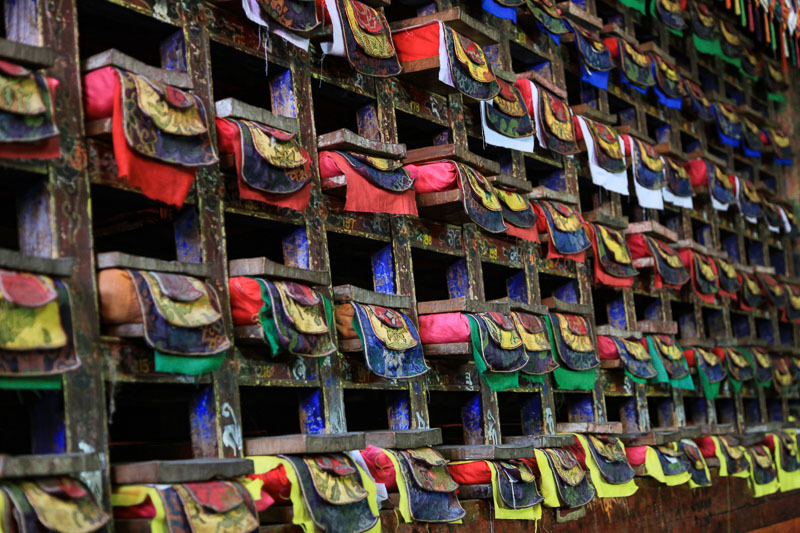 “Thyangboche must be one of the most beautiful places in the world. The height is well over 12,000 feet. 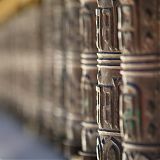 The Monastery buildings stand upon a knoll at the end of a big spur, which is flung out across the direct axis of the Imja river. Surrounded by satellite dwellings, all quaintly constructed and oddly mediaeval in appearance, it provides a grandstand beyond comparison for the finest mountain scenery that I have ever seen, whether in the Himalaya or elsewhere”. 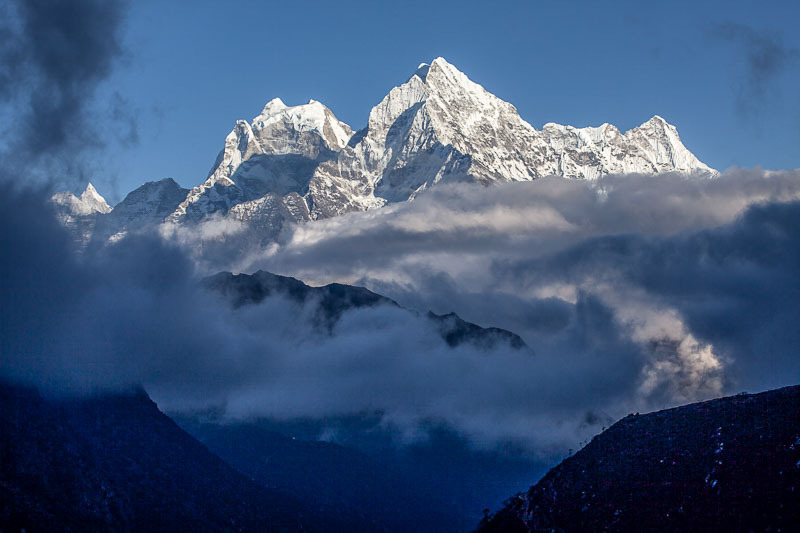 The early morning view across the town of Thyangboche is gorgeous and we will be sure to make the most of this by capturing the snow-capped peaks of the Himalayan mountains ignited by the sun. The more energetic may like to walk up a nearby hill for extra special vistas. After breakfast we set off for the the village of Dingboche. 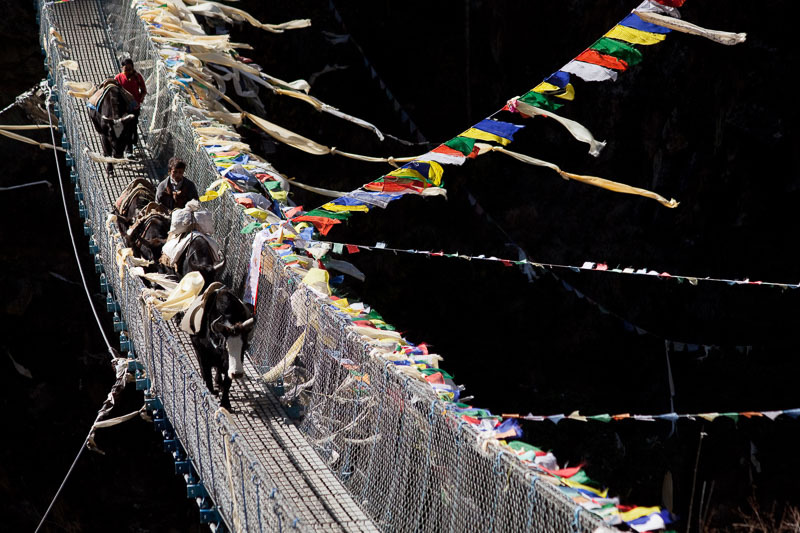 The The hike from Thyangboche to our lunch stop is filled with river crossings along wooden bridges, climbing up large steps through colourful gateways, standing aside to allow trains of Yaks carrying loads, their bells a constant back drop to our trek. 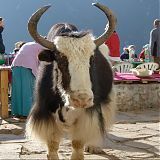 Often the Yaks will be taking essential equipment and supplies to Everest Base Camp. Our gradual climb will be taken slowly as we gain altitude, the Sherpa village of Dingboche is the highest settlement in this area. We spend two nights here which will help with our acclimatisation. 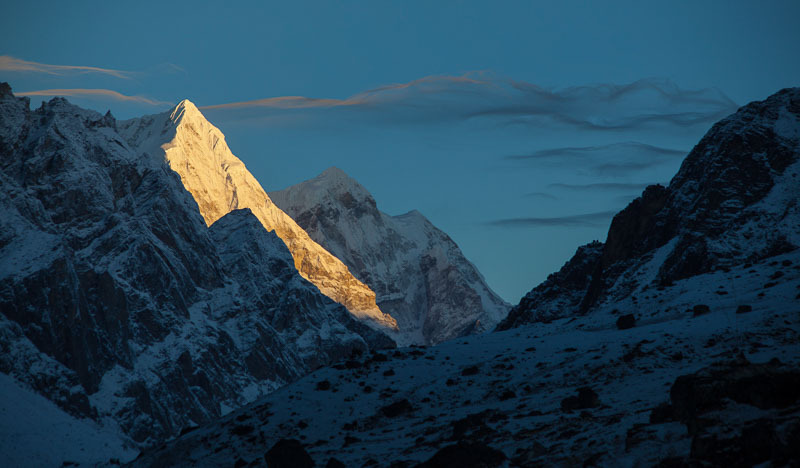 Dingboche is beautifully located under the icy spires of shapely Ama Dablam. Today is a valuable acclimatisation day. 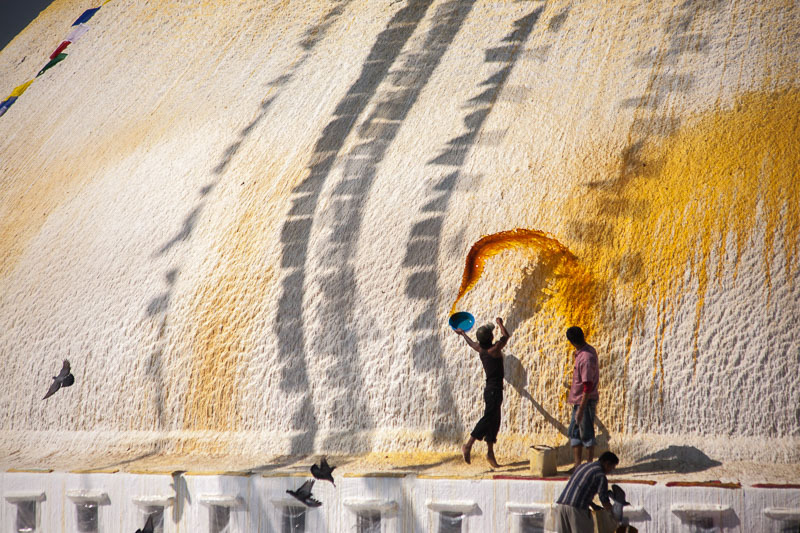 You may choose to explore the local settlement where there are many fine cultural and local shots to be made. It is important that we keep moving around albeit gently as this aids the acclimatisation process. It is possible to follow a gradual trail up the Imja Khola towards the pretty village of Chukkung 4750m For the hardy an attempt can be made to climb Nangkartshang Peak 5080m which is three hours steeply uphill and a further 2hrs down.The vistas from here are rather lovely, an array of peaks including Makalu the fifth highest mountain on earth. The less energetic should not despair for the views from the settlement itself are magic. 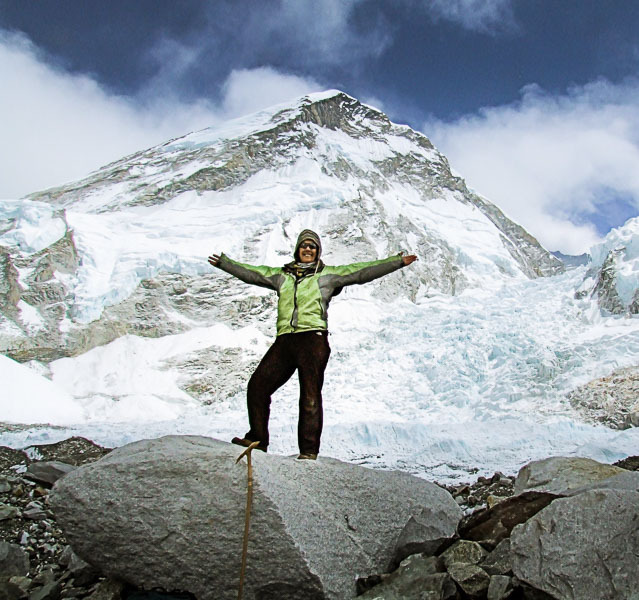 This day of exploration around Dingboche will expose us to the overwhelming beauty of the place and surrounding mountain peaks, but in reality we are still four days away from actually standing beneath them! Today we will be walking above tree line passing through pastures, glacial moraine and boulder strewn paths. The walking will be slow paced as we increasingly gain altitude. To start the day we walk on a good track which climbs at first, then contours beneath the steep east face of Taboche 6367m before reaching Dughla where the steep track levels off after the crest at approx 4840m. This beautiful small pass also known as Thukla is where we encounter several memorial shrines for climbers including many Sherpas who sadly lost their lives whilst climbing Everest. This is a beautiful place to contemplate, linger and photograph. 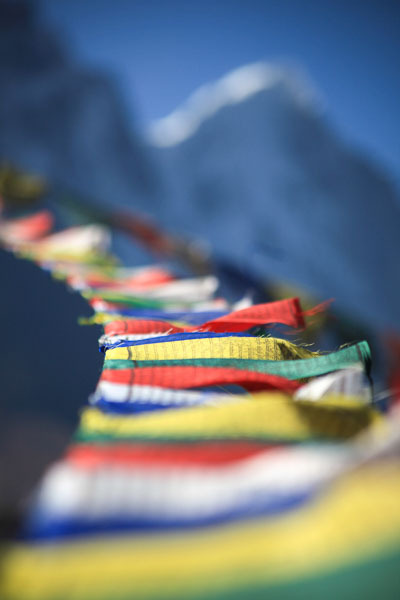 Fluttering player flags, ancient stupas and numerous rock cairns can be captured against a spectacular back drop of the world’s highest and most striking mountains. 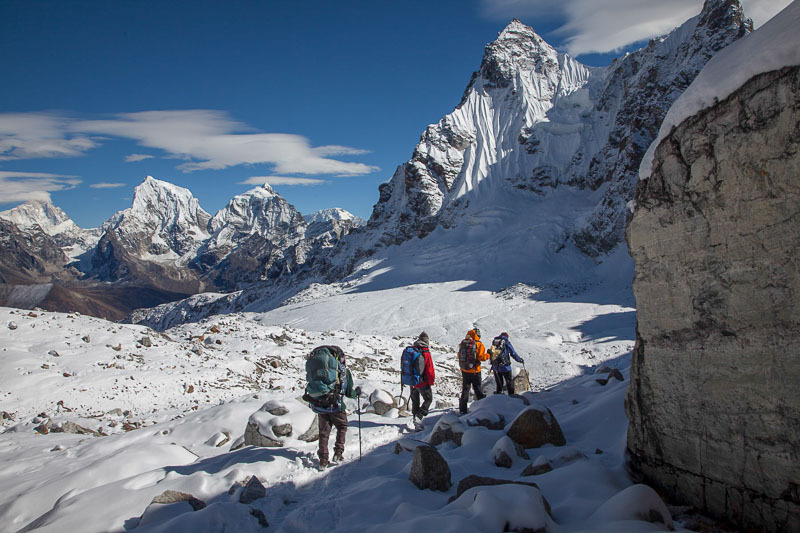 Reluctantly we return to the trail which continues climbing gently to reach our lodge at Lobuche alongside the famous Khumbu Glacier. Today we make an early start for Gorak Shep. Throughout the day the views are fabulous. Following the main trail over moraine beside the Khumbu Glacier we arrive at this tiny settlement in around 2-3 hours for a welcome hot drink and lunch. 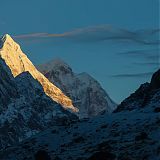 We will staying in Gorak Shep for just one night as this is the starting point for both Everest Base Camp and the summit of Kala Pathar. The lodge itself is in a spectacular position surrounded by remarkable mountain scenery. 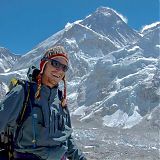 Today given good weather, we will set off sometime after lunch to climb to the summit of Kala Pathar, this will take 2-3 Hours depending on fitness. 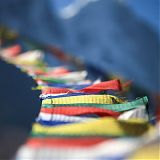 We are hoping to arrive at the prayer flag be-decked summit in time to photograph at sunset. 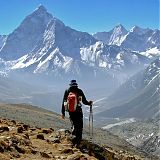 We will a have a panoramic view of the Himalaya including Everest’s magnificent south face, Mount Nuptse, Mount Lhotse, Everest Base Camp and the dramatic Khumbu Icefall. The summits will turn a fiery red in the setting sun. All too soon we will return downhill to our lodge for a welcome rest and dinner. 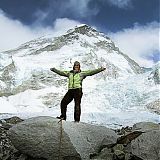 Tonight we will turn in early for bed as tomorrow’s walk to Everest Base Camp is to be our next challenge. Early morning we rise for breakfast before setting off on our trek to Everest Base Camp (5300m) Throughout this walk we will be surrounded by an icy and magical winter wonderland. 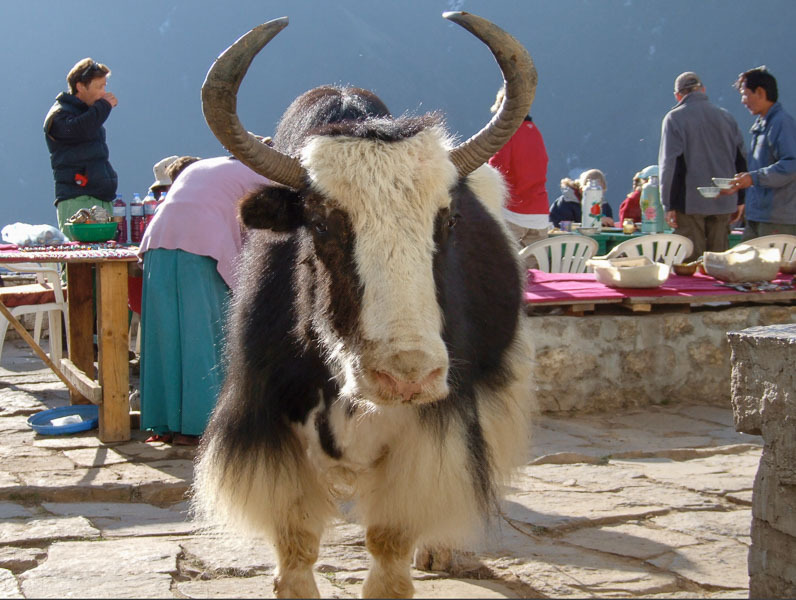 Yak trains will move slowly along the twisting path through the Khumbu moraine, porters straining with their heavy loads will stop to rest against giant rocks to catch their breathe and swooping Alpine Choughs will play with an energy that we can only dream of! Finally we will walk into the base camp, the feeling of arriving after many days preparation and physical exertion is incomparable. We will likely feel very humbled by the giant peaks surrounding us on every side. 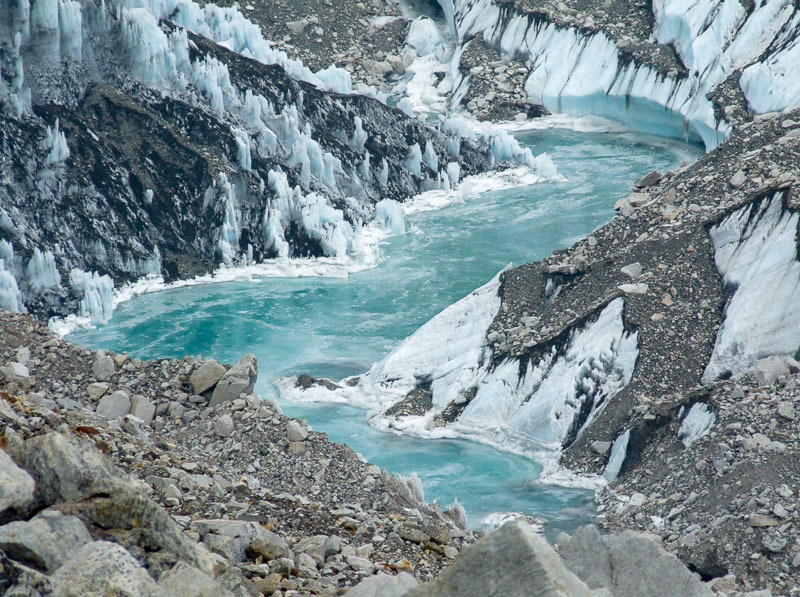 In the camp itself mountaineers will be preparing to climb the steep icy Khumbu Icefall which tumbles down to Base Camp like a mighty white wild water river from Everest’s South Col. 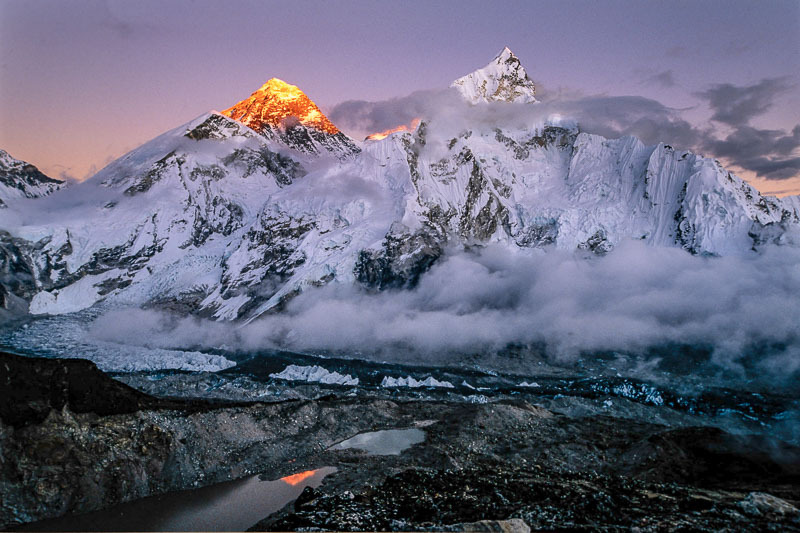 Here climbers pitch tents before attempting to climb to the summit of Everest itself. After spending a reasonable time capturing this magical place we return to Gorak Shep for a hot drink and a rest before continuing downhill for around 1000 m to our lodge in Pheriche. Today will be a long day with about 10 hrs walking and we should sleep well as our altitude is now 1000m lower than Gorak Shep. From Pheriche we will take two days to descend to Lukla. Our bodies should feel more energetic with each step that we take in a downwards direction! Oxygen will come flooding back into our lungs and we will be able to descend in a much shorter time than we ascended. We will more than likely take much enjoyment from photographing some of the vistas and subjects that we missed on the way up, or perhaps did not have the energy to do so! From Pheriche we pass through and photograph Pangboche Gompa (4000m), we cross the fast flowing waters of the Imja Khola on its magical suspension bridge, trek through gorgeous forests, pass by sacred mani stone walls and spectacularly located Stupas until climbing back down ancient stone steps to the Sherpa town of Namche. Our last day of trekking is to be savoured as we pass through thick forests, experience an array of birds and some final views of the mountains. The lovely Rhododendron bushes will be blooming and the terraced fields will appear even greener than when we first passed them, our bodies will feel well acclimatised. It will seem strange to arrive back in Lukla where we first set off many days ago. If we still have the energy it is always good to capture the markets, the streams of porters, wandering pack animals and an array local people just getting on with life in this busy hub town. This morning we take a second breathtaking plane ride in a twin-engine otter through the mighty Himalaya. The return flight from Lukla to Kathmandu is followed by a transfer to our three star Kathmandu hotel. 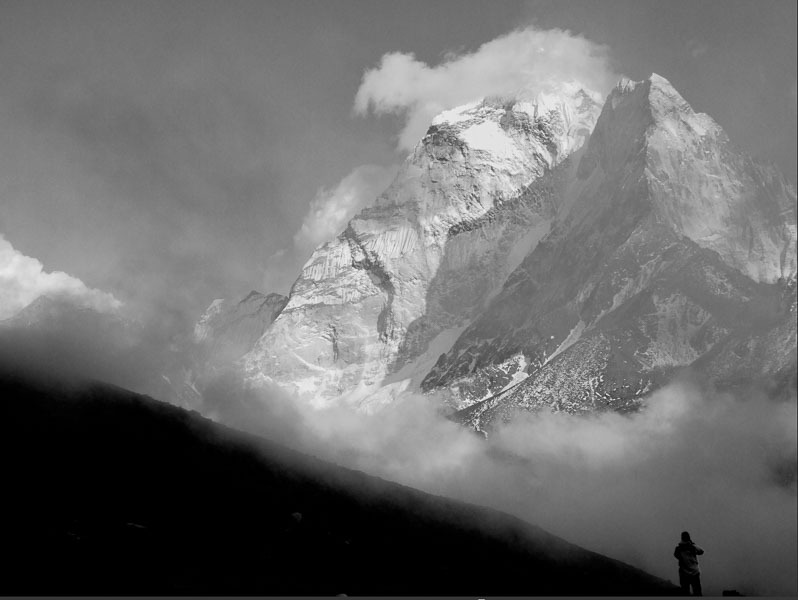 After lunch we will have the opportunity to review, discuss and work on our images, there are always some exciting moments as we re-live the wonders of our recent Everest experience. 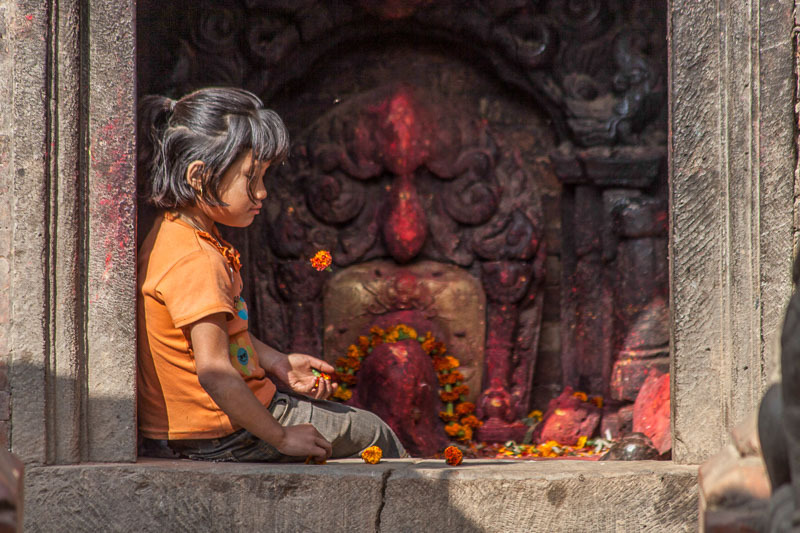 Our final day in Kathmandu. 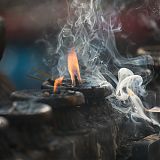 We have allowed an extra day here as occasionally the flights from Lukla to Kathmandu are cancelled due to the weather. We thought it would be better to have a spare contingency day to allow for this. The day will be free until the evening when we meet together for a final celebratory dinner and an image presentation. Should guests wish to explore the area more fully then we can arrange optional tours with a local guide. 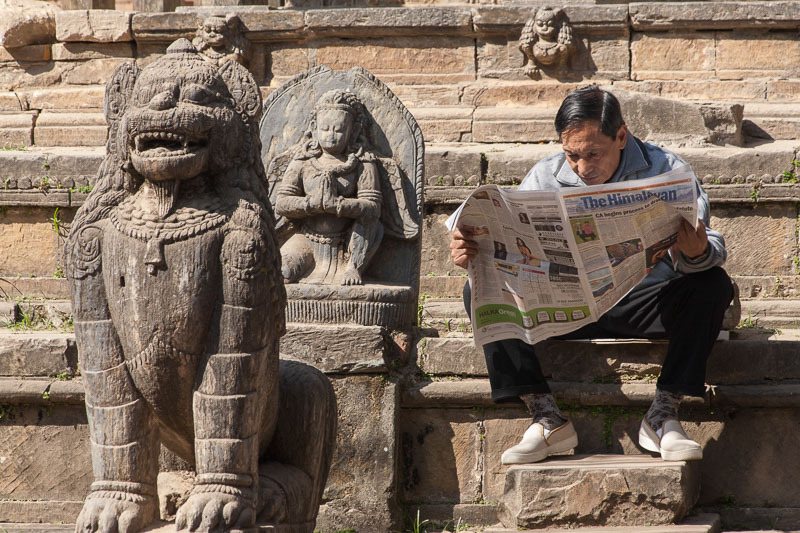 Perhaps some guests may enjoy re-visiting some of the locations we visited before the trek or perhaps opt for shopping or coffee & cake in the bustling and energetic streets of Thamel? We have not included lunch today to allow guests the freedom to choose to fit in with their chosen day. After a final breakfast together we depart from Kathmandu or maybe continue with your own plans. 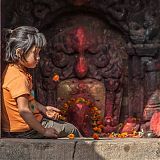 Together with our partner in Kathmandu we are able to arrange many other tours and trips for you such as a Chitwan jungle safari, river rafting adventures, a scenic flight, cycling or even another trek in a different area! Just ask at the time of booking. Participants generally arrive at different times since they will book their own flights. The first-night hotel in Kathmandu will be available for check-in at midday on Day 1. If participants arrive several hours before this, it may preferable to book an extra night in order to get some valuable rest. Please ask us if you would like us to book this for you. It is important that you let us have your international flight details so that we can arrange transfers to and from the international airport. In Kathmandu we stay in a three star hotel. If you would like a single room then there will be a single supplement, see price online. 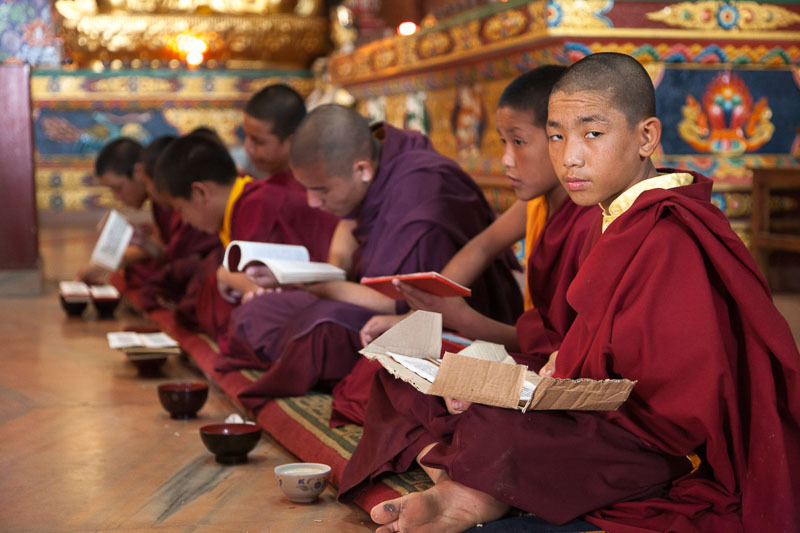 On trek we will stay in clean Lodge/Teahouse accommodation and you will share will another person of the same gender. Wifi can be purchased in most places on trek although coverage can be random at times. 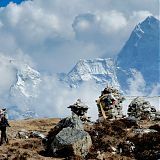 It is important that guests get as fit as possible before joining this trek/holiday. 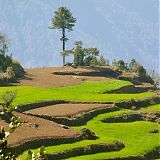 The best way to do this is to go for several hill walks of around 5-6 hours long before joining the trip. The fitter you are the more enjoyable you will find the experience. 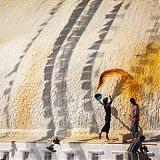 Although this is a photographic trek, it is unlikely that you will be ready for this unless you put some effort into preparing.